Have you tried Boom Cards yet? Your students will love learning with Boom! Try this free download to see this exciting new learning platform. 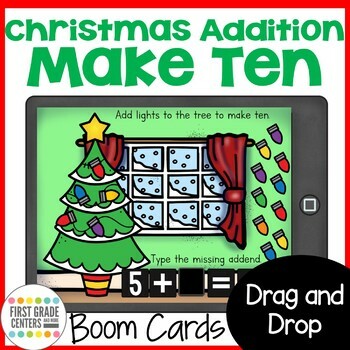 This set contains 10 digital Boom Cards to practice make ten. Students drag and drop ornaments onto the tree to make ten. Then they type the missing addend to the addition problem. With your Teachers Pay Teachers purchase, users new to Boom Learning get a three-month free trial of student progress reporting for up to 80 students. Your trial includes the ability to make up to 5 free DIY decks. You may upgrade or cancel at any time. Boom Cards play on modern browsers (released in the last three years) on interactive whiteboards, computers and tablets. Boom Cards apps are also available. Not sure if your browser is modern enough? Try this deck first! When you redeem your purchase, Boom Learning opens an account for you if you do not already have one. If you do not subscribe at the end of your trial, you will be able to continue using Boom Cards with the Fast Play feature. Fast Play does not track individual progress. If you do not subscribe we will delete your student records 3 months after the expiration of the trial to protect student privacy.